It has been reported that the Indigo Bunting is the Magellen of the bird world as it navigates by the stars at night. From my observation this is amongst the shyest of birds, as I only get brief glimpses of it as I travel the farm and surprise them around a corner. Someday, I would love to take his picture as proof of my stealthy approach. The Indigo Bunting is a member of the Cardinal family, yet leaves every winter early, returning to the same three areas on my farm each year. This diminutive bird appears to be a deep purplish to deep blue color because of light diffusion, but has no blue pigments in its feathers and is actually black. I have planted large areas of wildflowers where they nest, which they seem to really like. This strikingly colored bird is equally as shy as the Bunting. Staying deeper in the forest, this black-winged red bird winters in South America. He makes a chip-bang song. 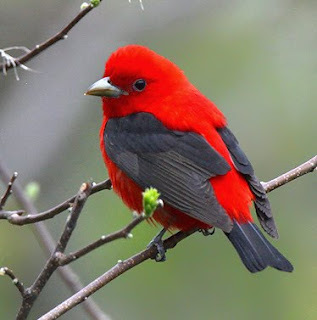 I saw my first Scarlet Tanager late last summer, alighting within 15 feet of me on a dawn Redwood I planted several years ago. I will never forget how amazed I was at his remarkable coloring. I don’t think he saw me as he stayed there for several minutes. I barely breathed for the entire time. Perhaps he did see me and was not threatened. Host and Guests.... 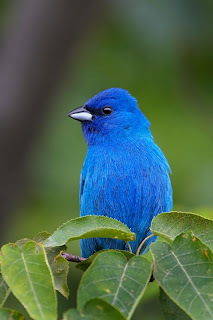 Please post any pix you have of indigo buntings. Such a beautiful creature. My wife and I are camping in Williamston NC and just saw a pair of Scarlet Tanagers. They were beautiful! They landed on a post right beside our camper. I'm hoping they will come back so I can get a couple of pictures to share!